Just last month I told you about a new Kalmbach book that featured SuperDuos and Twin Beads, and now we have the next step, which is adapting beadweaving stitches for all of the great new shapes out there: squares, Tilas, SuperDuos and twins, Rullas, bricks, lentils, daggers, and more. 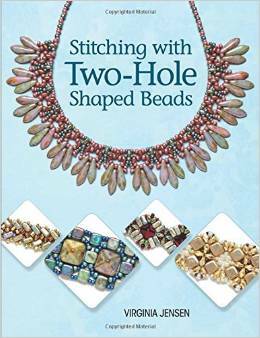 There are over 30 great designs to try in Virginia Jensen's Stitching with Two-Hole Shaped Beads. You may remember Virginia's work from Contemporary Cube Bead Designs (review at the link). No stranger to working with beads of different shapes, she has put together a wonderful collection of projects that will definitely grab your attention if you are a beadweaver. The book is arranged by stitch type, and starts out with basic stringing, then moving to peyote, braid, step, herringbone, crossweave, right-angle weave, and cluster stitch. I wasn't familiar with all the stitches, so it was really fun to browse through. Cluster stitch is Virginia's own invention! 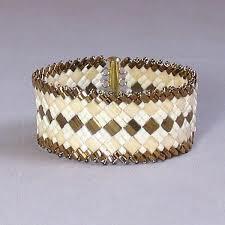 The cuff is lovely!!! Interesting...I just purchased some of those two hole beads to use on my cactus! I'll have to look up the book!!! Ooooo...did you get spikes or something like superduos/twins? ?